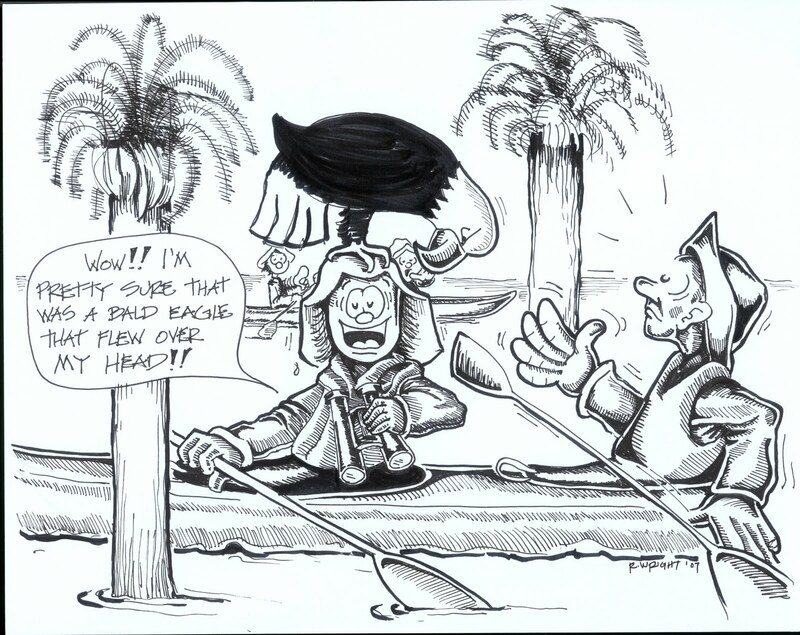 I just love this drawing because of the fun time we had paddling the lower Columbia River. We stayed at Skamokawa, on the Washington side of the river, and paddled up stream from there, and down stream, to the beach where Lewis and Clark holed up for a whole winter, near the mouth. Our trip was guided, and the guide liked bird-watching. But at the same time, we could see the landscape, and paddled through some old indian villages. That's what those funny looking palm trees you see in the drawing are, old pilings from buildings that had been built over the water, and the tops were rotted off, and ferns had been growing them. They were all over the place!! The birding was great, and obviously, we saw some bald eagles that were spectacular!